LOS ANGELES, CA — September 14, 2018 — Neutral Connect Networks (NCN) and Sky Packets announced today at Mobile World Congress their launch of a new joint venture named Sky Connect Networks (SCN) to address the growing need for creative financing of Smart City networks (WiFi, DAS, CBRS, Small Cell) and applications for venues in business improvement districts (BIDs), neighborhood and municipal markets. SCN offers a free WiFi as a service (WaaS) platform whereby SCN provides all capital expenditures for wireless network infrastructure and operational expenses (such as backhaul, power and network monitoring),yet charges only a nominal fee for the right to operate a branded and customized secure or open, Free WiFi SSID(s) for venue’s and communities of all sizes. SCN’s unique approach provides new avenues and options to communities looking for ways to digitally activate public spaces and main streets while empowering the venues with the tools needed to digitally market and advertise local businesses and community events. SCN is positioned to additionally offer private LTE to the venues for staff communication, IoT and other applications. 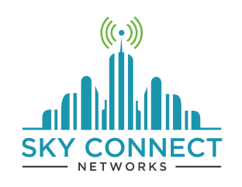 Please reach out to find more about Sky Connect networks at www.skyconnectnetwork.com and at info@skyconnectnetwork.com.